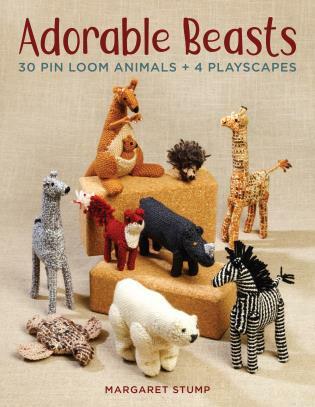 Although pin looms do make squares, there is so much more you can do with the cloth you weave on your pin loom, starting with the adorable creatures in this book. Margaret Stump has once again outdone herself with this creative collection of thirty "how did she do that" animals made just from pin loom weaving. Would you ever guess that you could make a giraffe, hedgehog, elephant, hippo, sea turtle, and so many more animals from these little woven squares? And it's so easy, too! Step-by-step, illustrated instructions for every piece in the book ensure your success. Once you've made the animals, give them someplace to play! Instructions for four playscapes are also included: an animal hospital with helicopter, emergency vehicle, and doctor; a baby and toddler play blanket with baby-safe animals; a medieval fort with lady, knight, and unicorn; and Noah's ark with ark carrier, play mat, Noah and his wife, and of course two of each animal aboard. All you need to get started are a 2" x 2" and 4" x 4" loom and some yarn. Detailed instructions of all aspects of weaving and joining are included to help you get started, even if you have never woven on a pin loom before. Learn what tools you need and the best yarn to use. Then follow the step-by-step instructions to make each animal or play item you choose. Mix and combine your favorite creatures to come up with your own play scenarios. Margaret Stump is the author of the successful books Pin Loom Weaving and Pin Loom Weaving to Go. She has been creating wonderful fabrics and projects with pin looms for more than forty years. Her work is creative, original, fun, and appealing to young and old alike. A longtime advocate for this vintage art, she is delighted to see so many artists and craftspeople rediscovering the joys of pin loom weaving. She lives in Mankato, Minnesota, and can be found online at http://www.pinloomweaving.com/.